Qwuloolt photo courtesy Joshua Meidav. TULALIP – Think of the Puget Sound as one massive estuary, fresh water from the creeks, streams and rivers of the uplands flow into the sound and mix during every tide with seawater from the Pacific Ocean. It’s the perfect recipe for salmon rearing habitat. Then add industry, boat traffic, shoreline development, acid rain and a cocktail of other chemicals. Suddenly, the perfect salmon nursery has become a precarious, dangerous and sometimes deadly environment. Today, in the Puget Sound, about half of historic estuary land remains. Urban areas such as Seattle and Tacoma have lost nearly all of their estuaries, but cities are not the only places losing this vital habitat; according to the Washington Department of Fish and Wildlife, only about a quarter of the Skagit Bay Estuary remains. Our own home, the Snohomish River watershed, which produces between 25-50% of the Coho salmon in Puget Sound, retains only 17% of its historical estuarial land. With the loss of estuaries and pollution on the rise it’s not a mystery why salmon runs and coastal wildlife are diminishing with every passing year. An estuary is a partially enclosed coastal body of brackish water, (a mix of seawater and fresh water), with one or more rivers or streams flowing into it that also has a connection to the open sea. The Puget Sound is essentially a huge estuary. It’s the second largest in the U.S., Chesapeake Bay, located on the east coast, is the largest. Brackish waters are where young salmon go to feed, grow and make the transition to the salt water; they’re also an ideal place to hide from both freshwater and saltwater predators. Without suitable estuaries, many young salmon don’t survive long enough to make the journey to the ocean. Enter Qwuloolt, an estuary located within the Snohomish watershed just south of Marysville. The name, Qwuloolt, is a Lushootseed word meaning “salt marsh.” Because of its rich delta soil, early settlers diked, drained and began using the land for cattle and farming. The levees they established along Ebey Slough, as well as the drainage channels and tide gates, significantly degraded the estuary by preventing the salt water from Puget Sound from mixing with the fresh water from Jones and Allen Creeks. Luckily, levees can be breached and streams rechanneled. In 1994 Tulalip and a number of national and local partners teamed up to begin the second largest estuary restoration in the Puget Sound. 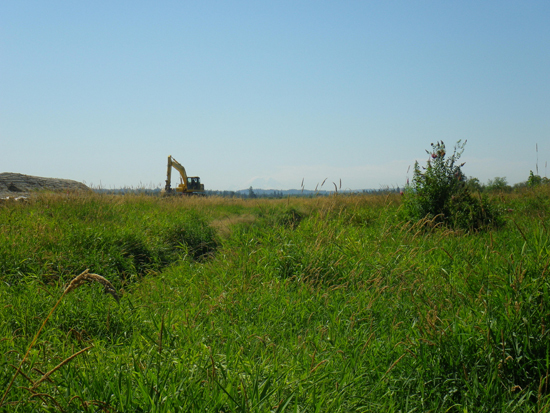 In 2000, Tulalip, along with a group of trustees (NOAA, USFW, NRCS and the Washington State Department of Ecology) began purchasing 400 acres of historic estuary between Ebey Slough and Sunnyside Blvd. In the years that followed, fish and wetlands biologists, hydrologists and experts in salmon recovery have helped reshape the once vibrant estuary turned farmland. Using historic information about the area, they’ve re-contoured the land to create more natural stream flows and removed invasive species. The final step in rehabilitating the habitat is to break through the earthen dikes and levees and allow the tides to once again mix fresh and salt water, to resurrect an estuary that provides shelter and sustenance for fish, wildlife and people. Qwuloolt will not only help salmon and wildlife habitat, the restoration protects every resident of the Puget Sound. Estuaries store flood waters and protect inland areas. The plants, microorganisms and soils of the estuary filter water and remove pollutants as well as capture and store carbons for long periods of time. This entry was posted in Environment, News, Top Story and tagged Estuary, Puget Sound, Qwuloolt Restoration Project, salmon, Tulalip Tribes by Kim Kalliber. Bookmark the permalink.